Smooth, caramel-like, sweet pumpkin butter spread generously on your favorite piece of toast, topped with green apples & pecans! This easy recipe makes the perfect breakfast, brunch, light lunch, or appetizer! Toast the slices of bread. In the meantime, thinly slice the green apples and chop the pecans. Spread a generous layer of prepared pumpkin butter over each slice of toasted bread. Top with a layer of green apples and chopped pecans. 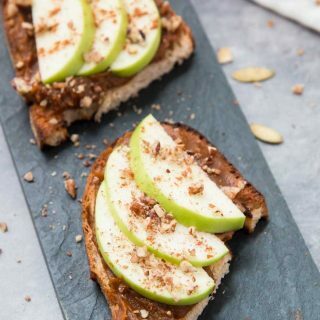 Cut the pumpkin butter toasts in half and enjoy! Gluten-Free - use your favorite gluten-free bread. To make this an easy recipe, prepare the Pumpkin Butter ahead of time and store in the fridge. For best results, spread the pumpkin butter once the toast has cooled to room temperature. The pumpkin butter should be cool from the fridge or at room temperature so it's easier to spread. Cut the toasts in half for mini or bite-sized appetizers to serve at your next brunch!